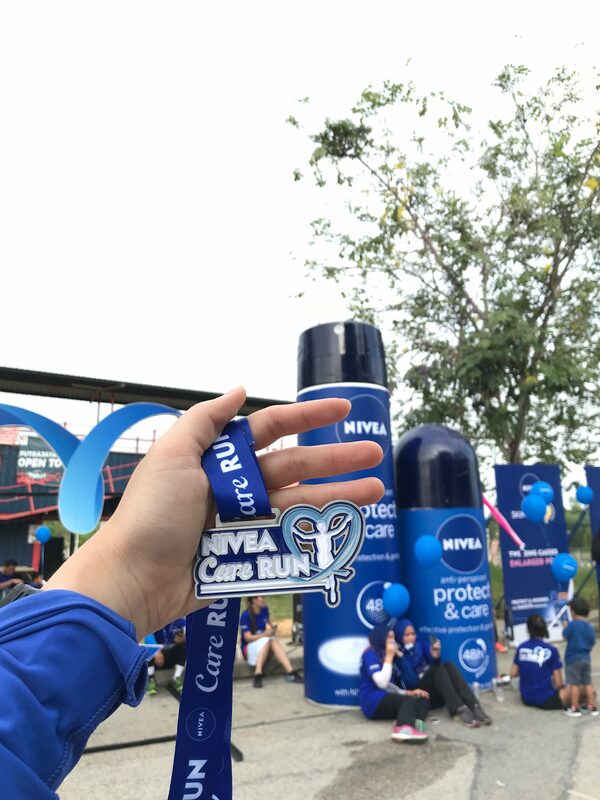 I was delighted when I was invited to participate in Nivea Care Run 2017 as one of the media and bloggers. Nivea was one of the brands that is close to my heart – I have been using Nivea for years, I am sure at one point in our life we had used a bottle of Nivea deodorant. Proof that taking care of your underams can be fun too! However, this newly launched Protect & Care deodorant is definitely different and special. Not only must we be concerned about the cleanliness of our underarms, we must protect and care about the skin too. Just because our underarms are covered most of the time, it does not mean that we should pay less attention to it or neglect it. Thanks to the special Nivea Creme ingredient in this deodorant, my skin felt smoother and appeared lighter too. I’m sure I was the only one who wished these giant deodorants weren’t just replicas! In conclusion, it was a fun and informative run. I get to learn a lot of tips on taking care of my underarms, along with the generous goodie bag. Many thanks to Janet and Nivea for the slot! 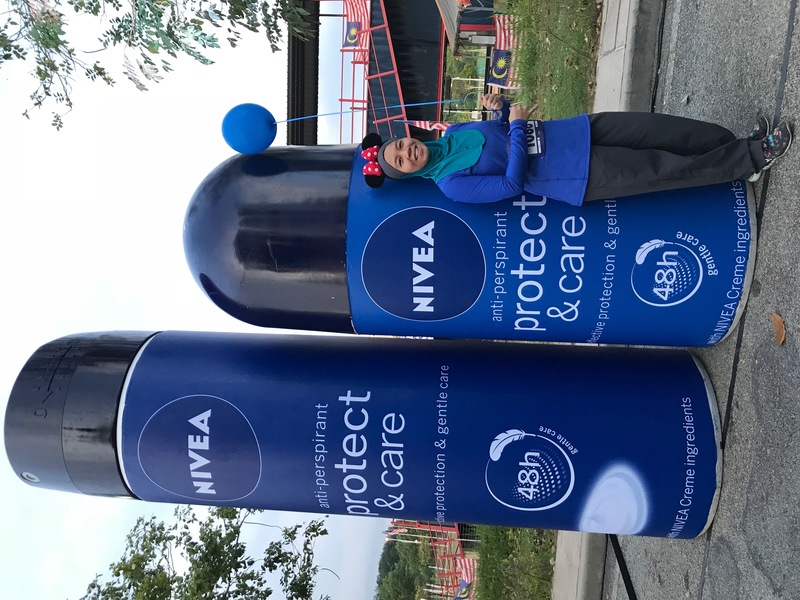 Putrajaya, 29 October 2017 – Almost 2,500 Malaysians gathered at Putrajaya for the NIVEA Care Run, hosted by NIVEA Protect & Care, a gentle yet long-lasting deodorant designed to care for the underarm skin. 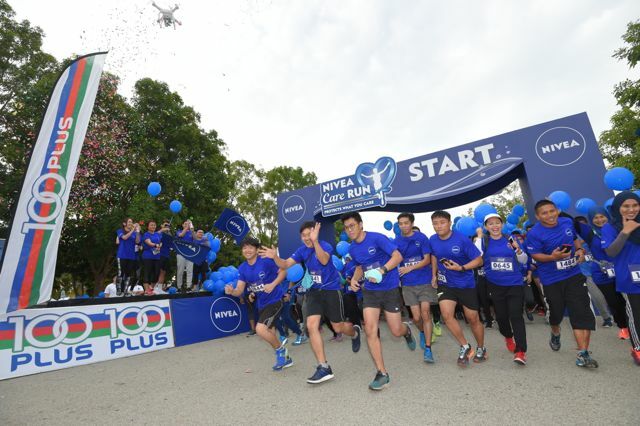 Expanding on its theme, ‘Protects What You Care’ to include care to the community, a contribution of RM20,000 from the run was also donated to Yayasan Budi Penyayang Malaysia (Penyayang), an established charity organisation that supports Malaysians in need. 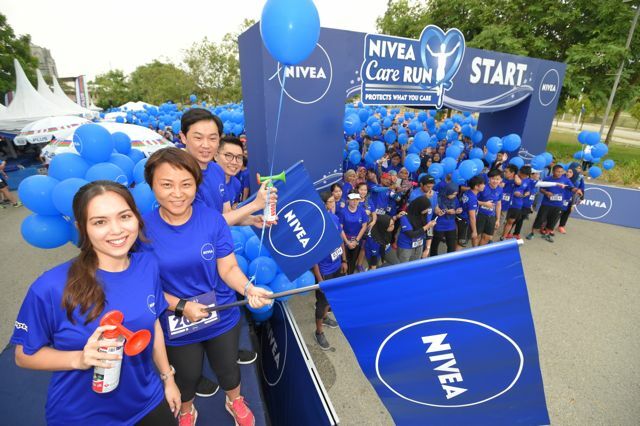 Pic 1: NIVEA Care Run flag-off (from far left): Celebrity guest Siti Saleha; Ms Shirley Toh, Sales Director of Beiersdorf Malaysia; Mr Ng Hock Guan, Country Manager of Beiersdorf Malaysia & Singapore and Mr Cheong Wai Lun, Head of Marketing of Beiersdorf Malaysia. NIVEA Protect & Care deodorant uses an alcohol-free formula that is tough on sweat, offering up to 48 hours of protection, while its skin-friendly ingredients leave underarms skin softer and smoother. Enriched with the essence of NIVEA Crème, it nourishes and cares for the underarms with its distinctive ingredients and delicate scent. To raise further awareness about underarm care, participants of the NIVEA Care Run were presented with plenty of skin facts such as the extent of skin damage caused by shaving and tweezing and how debris removed during shaving may contain up to 36% of skin*, shown via a skin test demonstration. 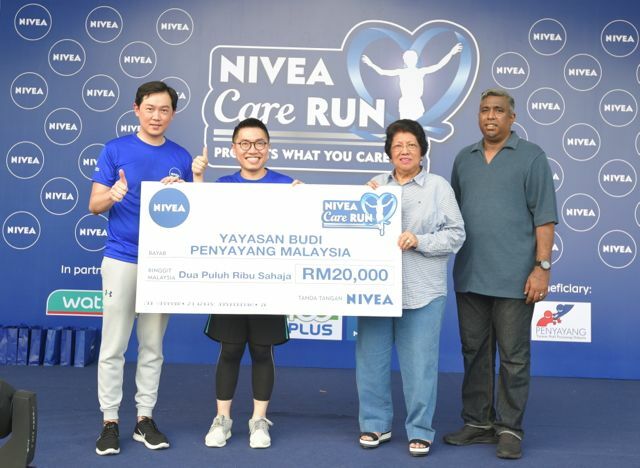 Pic 3: A contribution of RM20,000 from NIVEA Care Run was presented to Yayasan Budi Penyayang Malaysia (PENYAYANG) to support Malaysians in need. [From L-R] Mr Ng Hock Guan, Country Manager for Beiersdorf Malaysia & Singapore, Mr Cheong Wai Lun, Head of Marketing of Beiersdorf Malaysia, Dato’ Leela Mohd Ali, Chief Executive Officer of Yayasan Budi Penyayang and En. Ariff Farhan, General Manager of Yayasan Budi Penyayang. 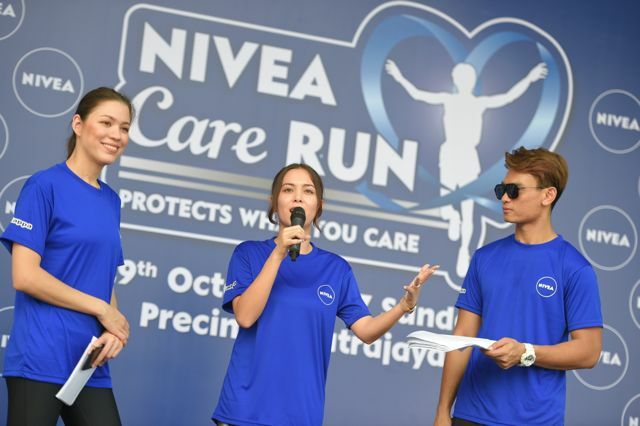 Other activities at the run included a “Protect & Care” pledge wall where participants could leave messages to express their care for loved ones, a PENYAYANG booth, lucky draws and photo booths, with the presence of local celebrities Siti Saleha, Nadia Heng and Fiqrie. Pic 4: Participants pledge messages of “protect & care” for their loved ones at NIVEA Care Run. 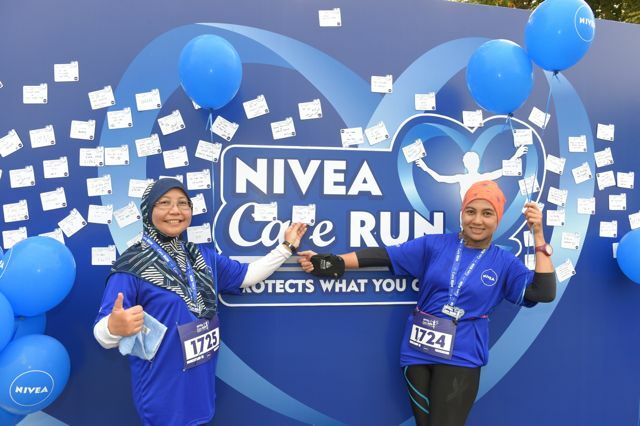 With great support from runners, sponsors and partners, the NIVEA Care Run was a resounding success, achieving its objective to raise awareness about underarm care while raising funds to help protect and care for others. 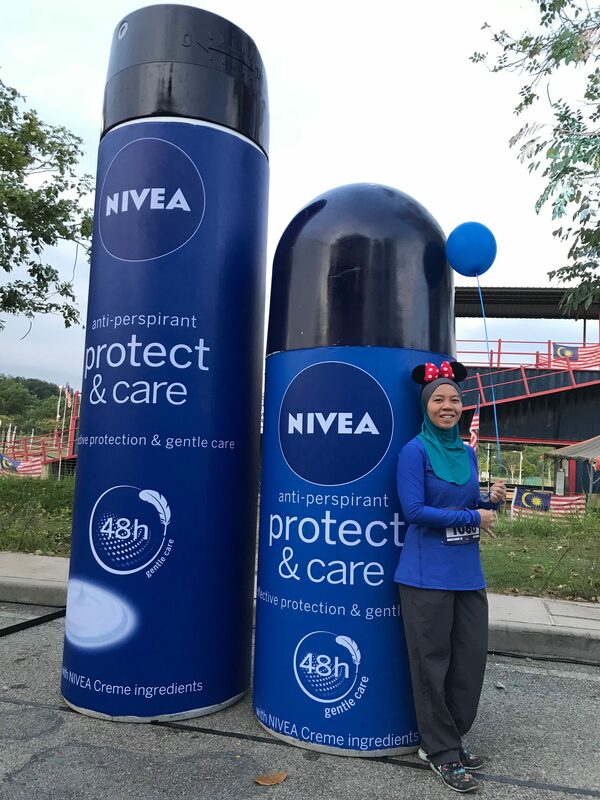 NIVEA Protect & Care deodorant is available in 50ml roll-on bottles at RM11.30 and 150ml sprays at RM17.50 (West & East Malaysia) at all leading stores and pharmacies nationwide. For more information, visit www.facebook.com/mynivea to find out more about NIVEA products. MBD 2017: A non-competitive event worth joining. Fun runs such as Milo Breakfast Day is a family and friends affair. Year after year, it keeps getting bigger despite being a non-competitive event. In fact, the slots in Putrajaya were always sold out in less than 24 hours after it is launched! (I was not ashamed to admit that one of those person who sat in front of the laptop, constantly refreshing the registration page). So, what’s so great about this event? The endless flow of Milo, of course! Somehow, it will never taste the same as how we make it by ourselves at home, and I wonder what do they mix in that drink to make it taste so good! I think I had more than 3 cups through out the event, because it was really addictive. 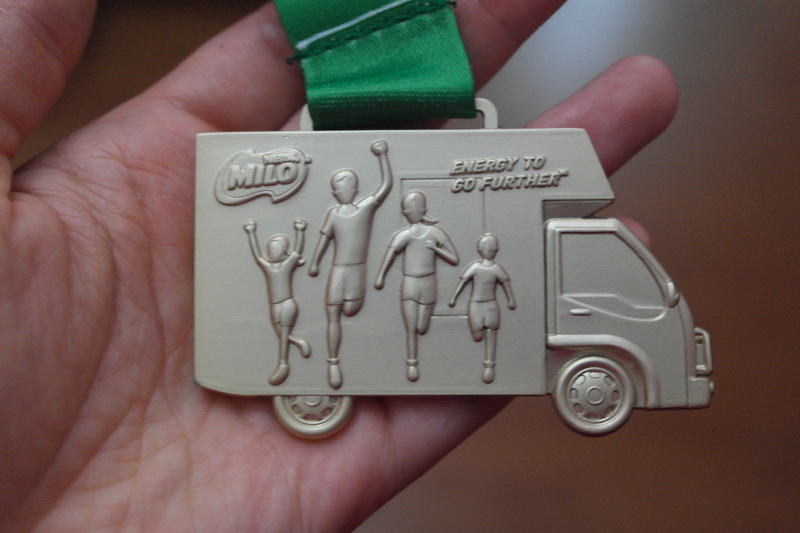 Everyone is running towards the Milo lorry! 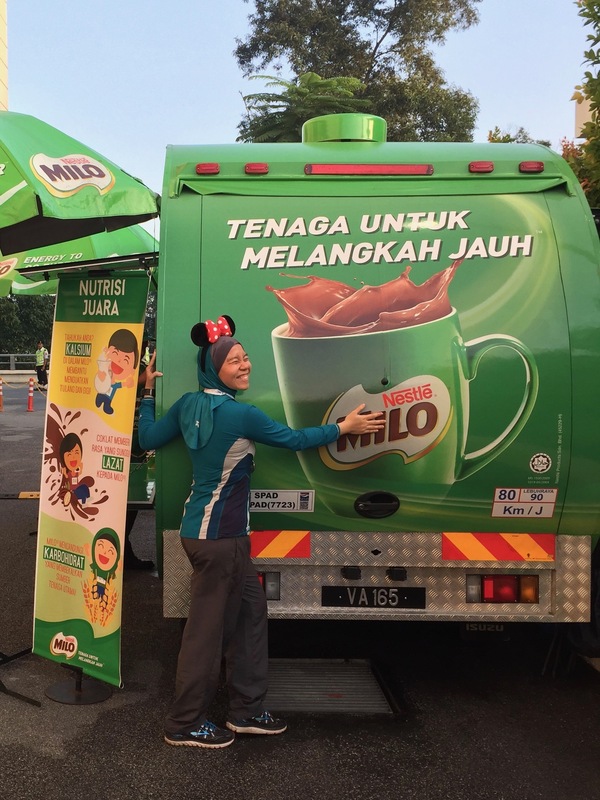 Picture was taken at a different event, but my love for Milo lorry is still the same! It is a fun run. As the name implies, it is FUN! Don’t stress about the crowd, the timing, the gear, the nutrition, etc. It is a great platform to introduce beginner runners. Once the beginners realize that running is an enjoyable process, they will eventually sign up for a more serious event. It is a healthy way to bond with friends or do a family activity. Fun run encourages group or family participations. So instead of hanging out at the mall or in front of the tv, why not go out and move about? So if you need to take a break from chasing after PBs, just kick back and socialize, or take your kids for a healthy activity, a fun run such as this is worth joining. Read about my last Milo Breakfast Day here, 2015 edition. After one week of resting (with the exception of a couple of crossfit sessions at Fuel Athletics) to give my knees a break from last week’s full marathon at Kuching Marathon, I finally decided that it is time to start training for my next big race: Cameron Ultramarathon or Cultra for short. I did an ultramarathon once, so I am not worried about the distance. With enough LSD training, I have a high chance of completing the race. However, Cultra will be different because it will be a trail run, and elevation is not a stranger. In fact, trail running IS elevation. Therefore I must learn to embrace it rather than being in denial thinking that road LSD will be sufficient. I have to prepare my feet for a lot of uphills, downhills, and uneven terrain. 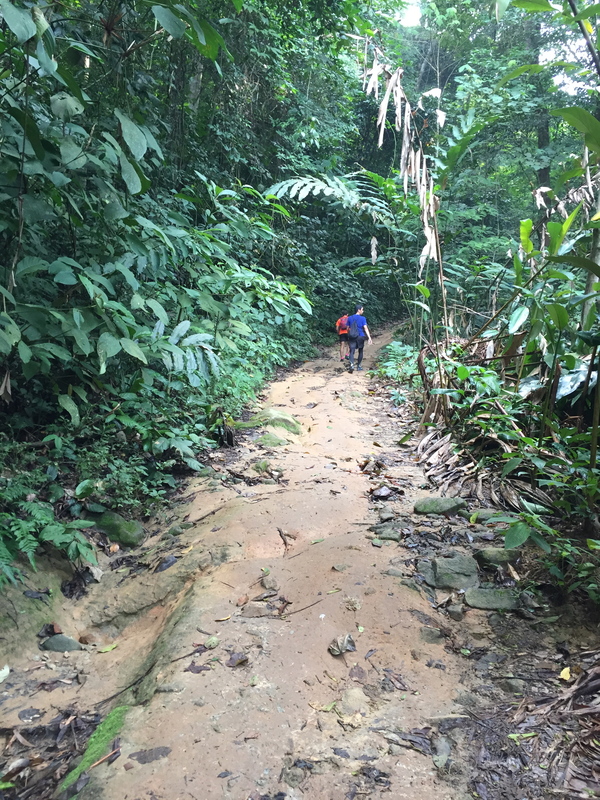 To get a taste for Cameron Ultra’s elevation (2240m) I head to the tallest peak in Selangor called Gunung Nuang. 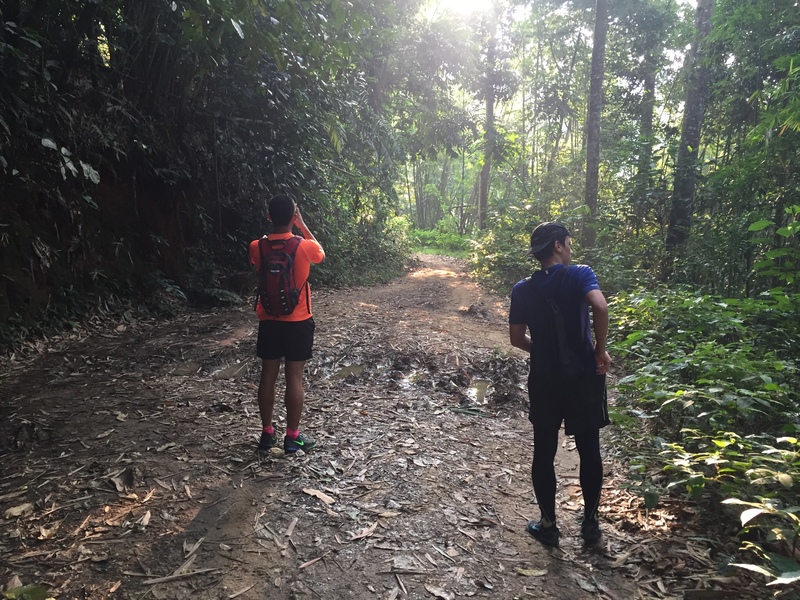 Gunung Nuang has a trail fondly known as ‘Nuang loop’ among the running community. The loop consist of 5km uphill to the first checkpoint called Camp Lolo, then another 5km downhill to the entrance. The 10km loop was only 530m total of elevation gain, however I was panting! Overall, it took me about 2 hours (at a very leisurely pace) to complete one loop. Then I repeated the same thing again. Hey guys can I know what your legs are made from? Because I need the same thing for my legs to keep up! There is never a lack of company in the trails. “Why is this human with only 2 feet is so eager to run? 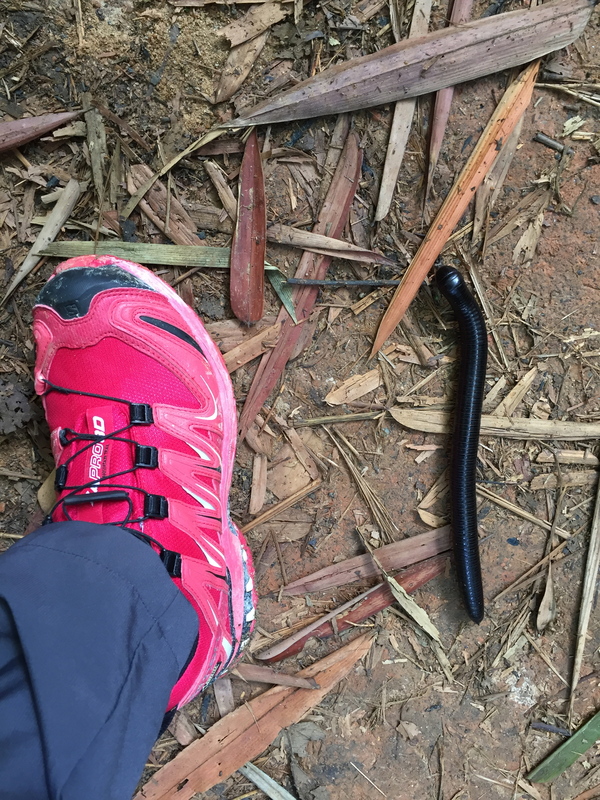 I have hundreds of feet yet I never want to go up and down these Nuang loops.” – said the giant centipede. Looks like the Nuang loops will be my training ground for the next few weeks. I will be back again to train harder! The next day, I head to an event called My Buddies Run for a quick 5km fun run. I rarely participate in short distance events, but after yesterday’s hard work I took this fun run as a way to reward myself. The highlight of this event was not to break any PB, but rather getting dressed up in costumes and just simply enjoying the race since the route was easy. Many came dressed to impress! My Minnie Mouse ears was nothing compared to the scale of their costumes. Clearly I was excited to get dressed up. Just like any event, one must do their best to follow according to the dress code right? 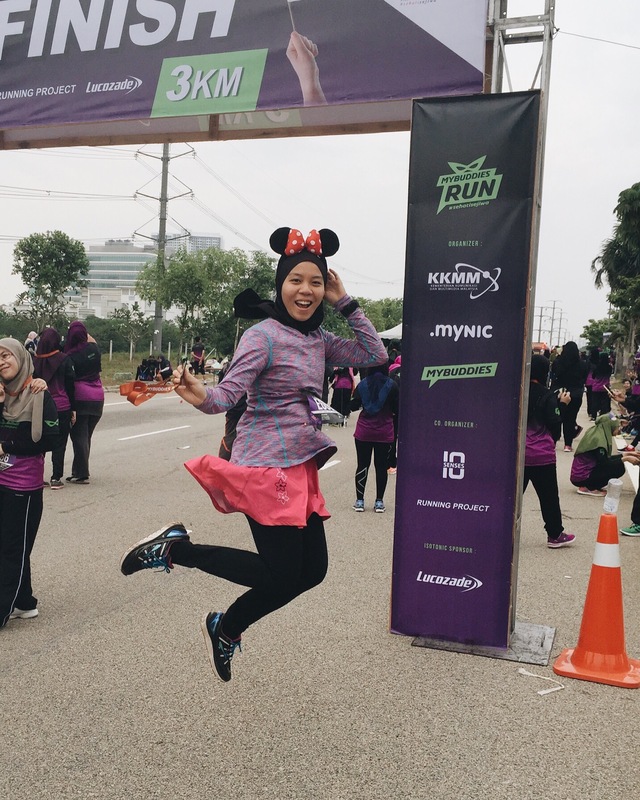 Fun runs gave me a fresh perspective on running. Since it was a non-competitive and friendly event, many families came with strollers, elderly couples walked holding hands through out the route, and kids jumping around in their costumes…Looks like it is never too young or too old to inculcate the joy of running! It has been a productive weekend for me. Now I am all recharged and ready to face Monday again! 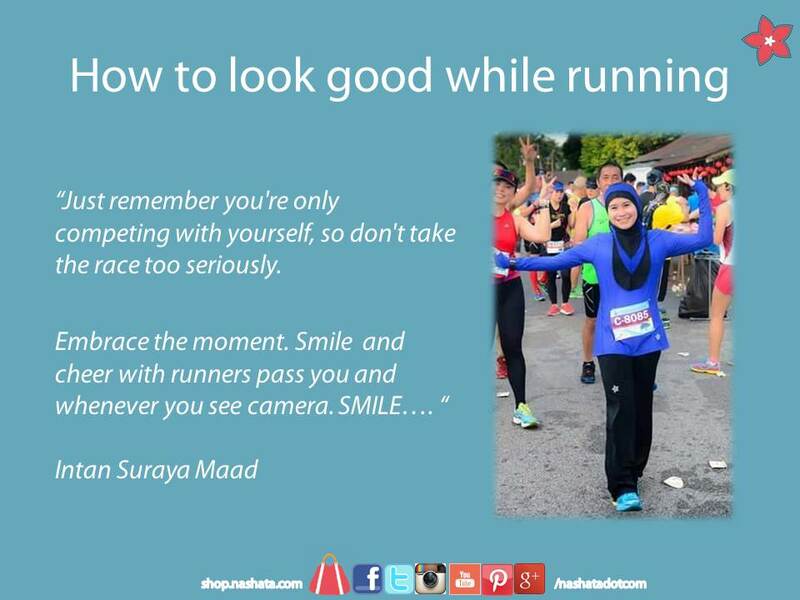 The Malaysia Women Marathon is an event all running girls should look forward to because it is full of awesomeness. This year, the 3-day Awesomeness (4-6th March) started with a 2-day expo at Bandar Rimbayu, followed by the race at Dataran Kemerdekaan Shah Alam. The weather was really hot. You could sweat just sitting doing nothing. All the vendors were ready setting up their stuffs for sale at 10am. 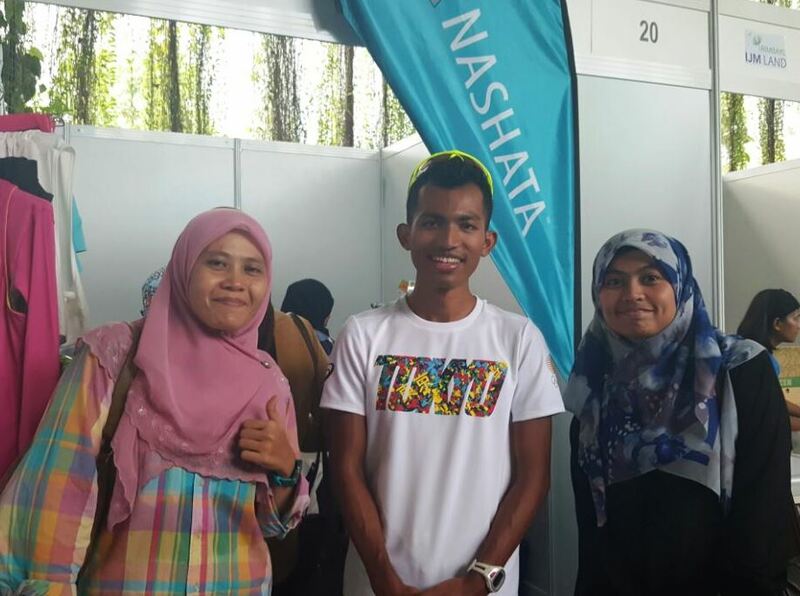 Nashata booth offered the same discounts as available online, except for Raazgloves which were going for RM10 only at MWM!. We were lucky to have a booth next to Marathon Baker, and they were super friendly. We bought a lot of chocolate brownies from them and their drinks were very nice too. As expected, the crowd wasn’t that many on the first day. Most who came were volunteers and MWM runners who came to pick up their race kits. Many left with many race kits in hands as they picked up race kits for group members and friends. We received a lot of visits from our beloved customers and friends. 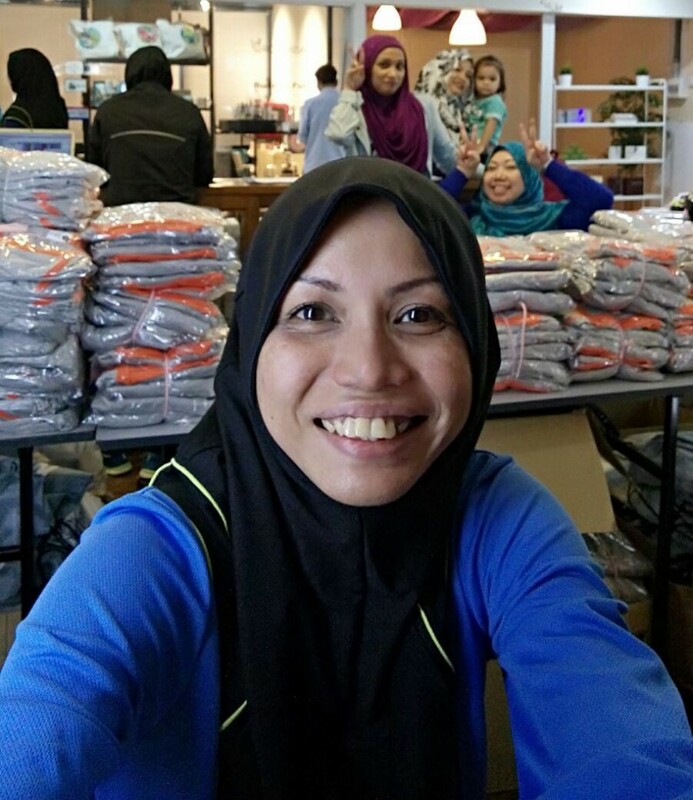 Here’s one with Hana who came to purchase from us. 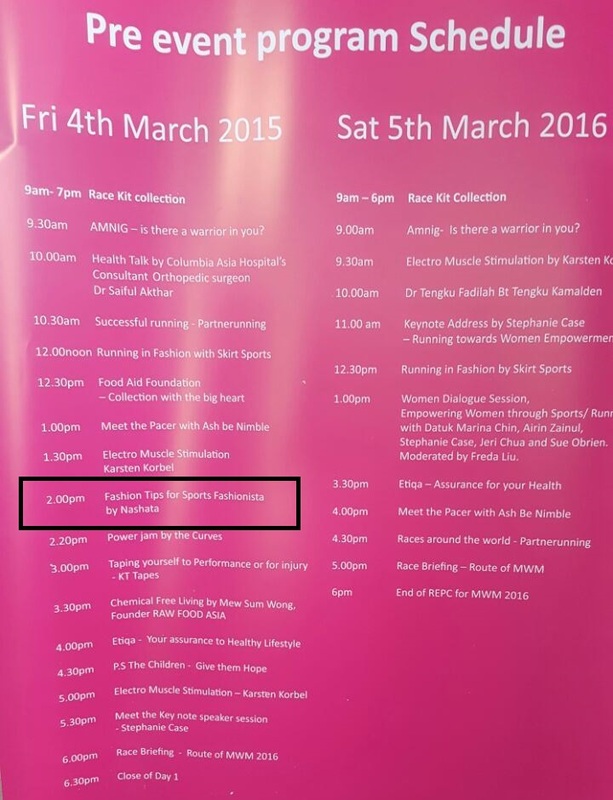 The organiser lined up a series of talk covering several topics on fitness and fashion shows. Nashata shared about Fashion Tips for Sports Fashionista on Friday, 5th March 2016 2pm. Here are a couple of slides among the ones that we shared on what to wear, what color to choose, how to look good while running. The props at the Expo was vibrant and colorful! This is only one of them. Quite Retro don’t you think? 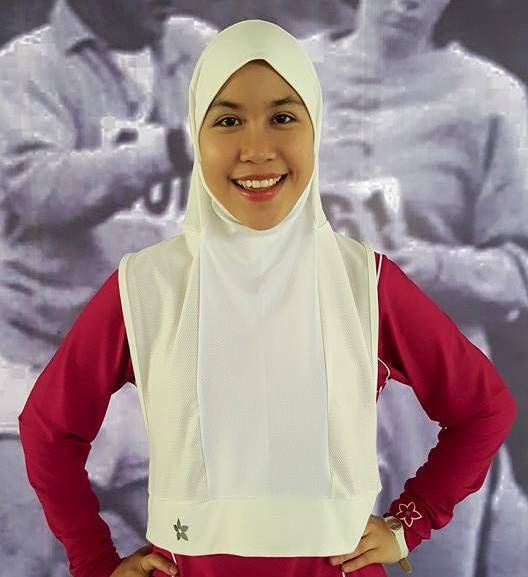 Hooda Sports Hijab was available for fitting so many came to try it out and place orders. On the second day, ie, 6th March, Datuk Marina Chin was among the honorable speakers for the Women Dialogue Session on Empowering Women Through Sports. She is indeed THE lady in sports. She was a national track queen, who later coached young athletes. She ran 100 – 400 meter hurdles and won seven gold medals at the SEA Games in the 1970s. Marathon and tracks are no different. They require running, training, strong legs, determination and good diet. Her passion in sports shines till today as she is now the Chef de Mission to 29th SEA Games Kuala Lumpur 2017 under the Olympic Council of Malaysia. At the Expo, she spoke about her passion in sports and that her career in sports never fade away after winning the SEA Games as she continued to coach athletes after she pursued studies in the US. She also reminded parents to allow children to choose what they want to pursue in life and not push unrealized dreams into children. 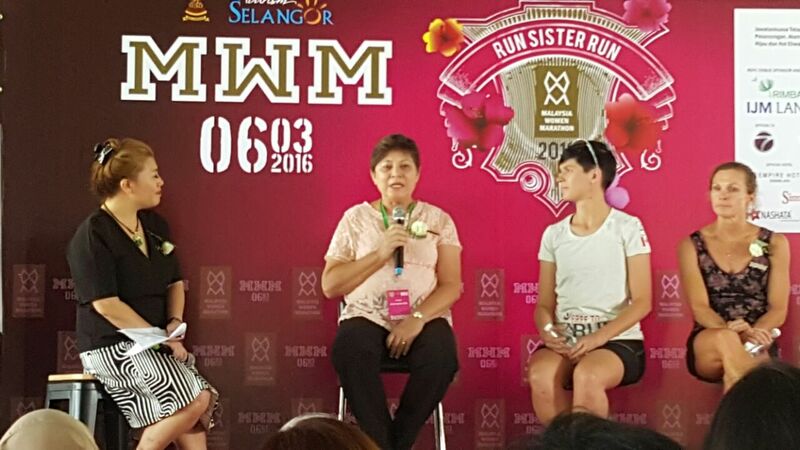 The session was moderated by Freda Lui, the producer at BFM 89.9, also a runner. I left the session feeling blessed. I am blessed because I can exercise my rights to perform fitness activities at peace in Malaysia. In certain country, you can only train by running up and down the stairs. It is unheard off, but it happens. Stephanie Case, the founder of charity FreetoRun is an ultra runner and she lives in Gaza. She helps girls and women in conflict-affected communities to do sports. Now – that is passion, empowering & amazing. Hence the reason why – I will not miss sharing sessions at MWM in the future! I was lucky to be seated next to Datuk Marina Chin at lunch. I missed the memo, busy, was called in later, came in late and Alhamdulillah – sheer luck placed me next to her. 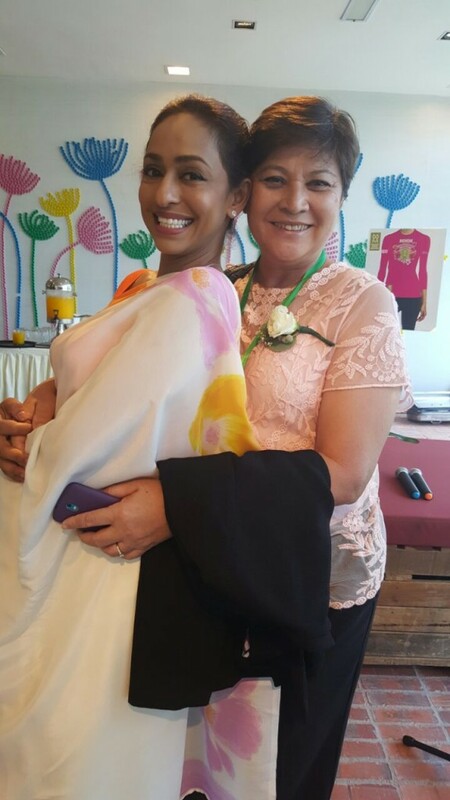 Datuk Marina is tall, motherly, gentle and BEAUTIFUL. Just look at her posing with Dato’ Beatrice Nirmala, Mrs. Malaysia 2007, another beauty who does not age. Edan Shah & Hijabi Marathon Runners. 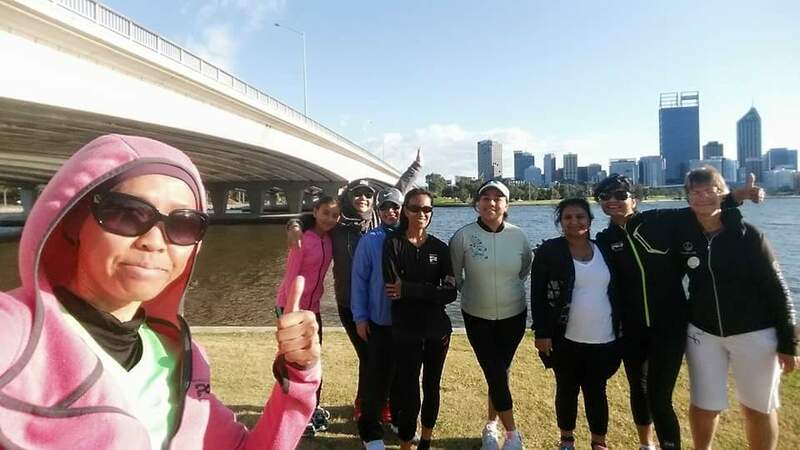 I was not able to run due to dehydration and my right knee was still hurting, but the Nashata runners (Intan Suraya, Eda Fatimawati, Nur Nahsuhah, Azlina & Pacer, Efah, Aina) ran their heart out that morning. 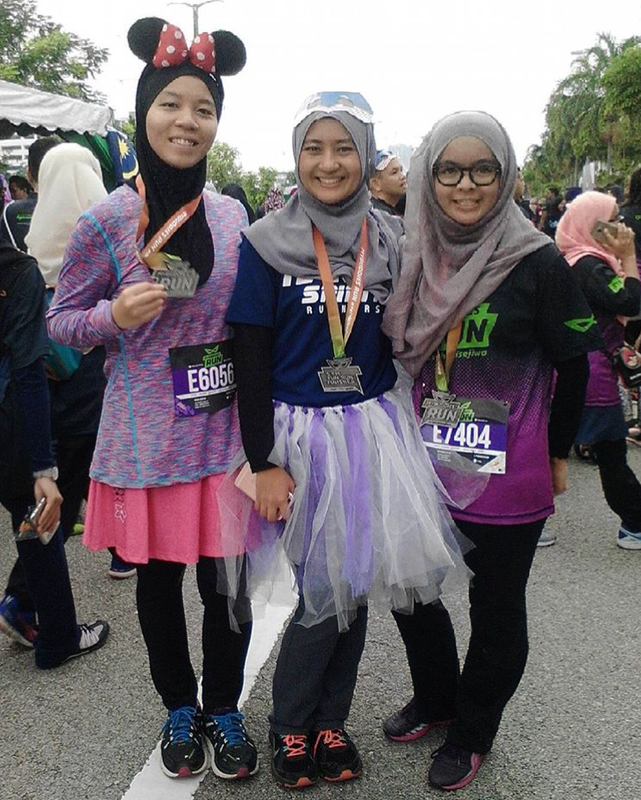 The girls registered for full marathon (42 km) and one did half marathon (21 km). Sadly, this year, the girls are not too happy with their run. Reasons aside, one gave the idea about running 5 km fun run at the next MWM. I think it is an awesome idea. Just look at all the happy faces of the runners at the 5 km and 10 km! 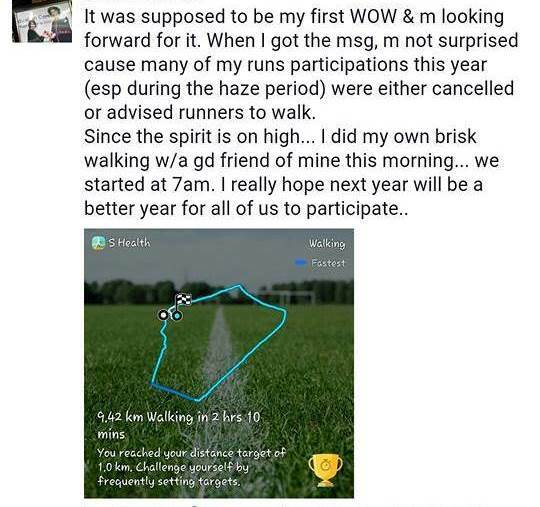 We should fun run then! It is heart-warming to learn the main sponsor and associates wore Nashata for the fun run. Only at MWM, you get such support & sisterhood. My special thanks goes to Karen Loh who put her heart and soul in making MWM beyond a running event. Only this iron lady & team can pull such a dazzling run! So girls, miss not the MWM next year! Can’t have enough for just one run? Well, big surprise for you! 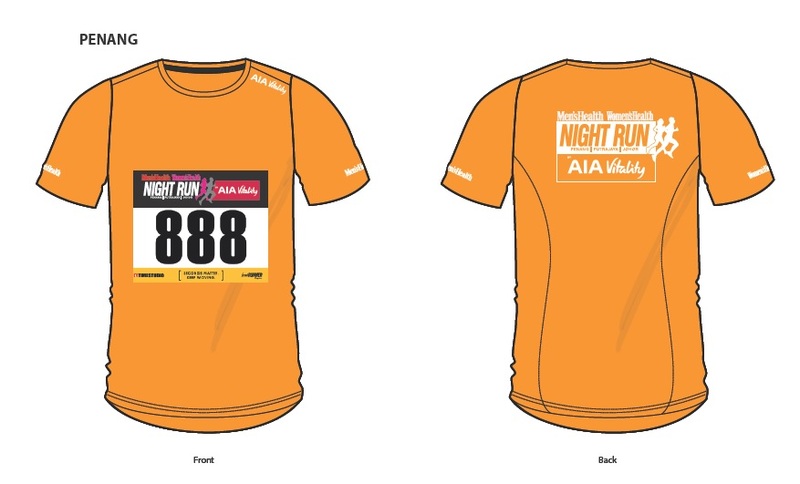 Men’s Health Women’s Health Night Run by AIA Vitality offers you three night runs in Penang, Putrajaya and Johor. 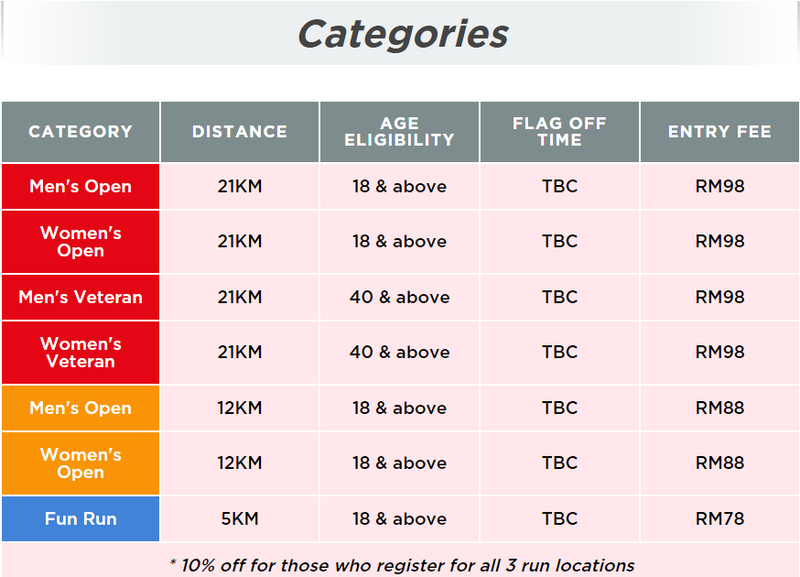 Here we are announcing you the running events details. The age limit of the running events is 18 and above that consists of three categories. 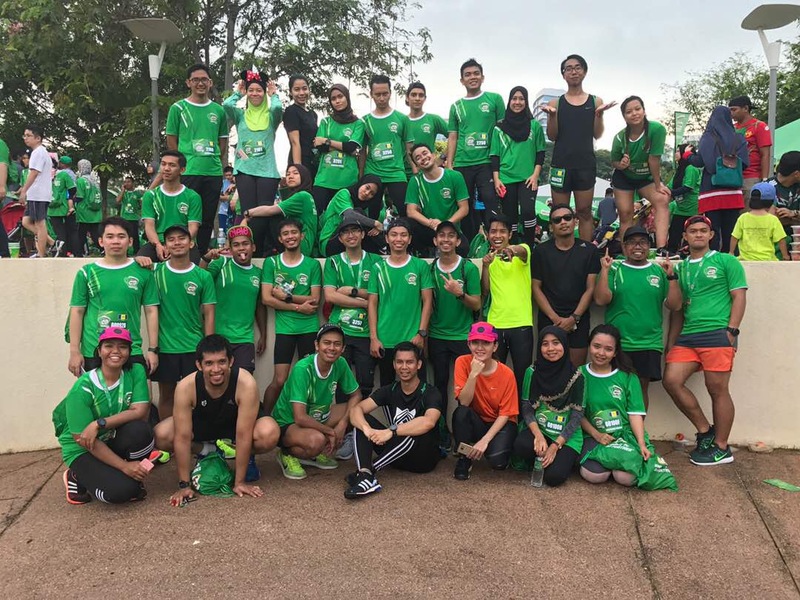 For true runners you can join the competitive run (12km and 21km), while for the beginners who’s interested in running just for a start, you can join the fun run (5km). Running at night keeps you away from UV rays. Over exposure to UV rays can cause skin cancer and damage your eyes. So if you plan to run for long hours and sensitive to the sun, night runs may work for you. Below is the summary of the events. Race kit consists of runners T-Shirt, a number bib attached with timing chip, safety pins and race guides (if any). 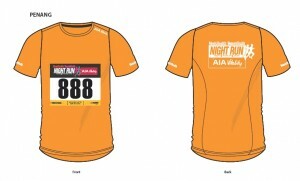 The theme color for the Penang, Putrajaya & Johor Night Runs are orange, red and blue respectively. Runners who do complete all three runs will also be rewarded with a unique “trifecta” medal – a three-in-one medal that clips together – as a special memento to commemorate the experience and achievement. Quickly register before the registration close for the all the three locations. 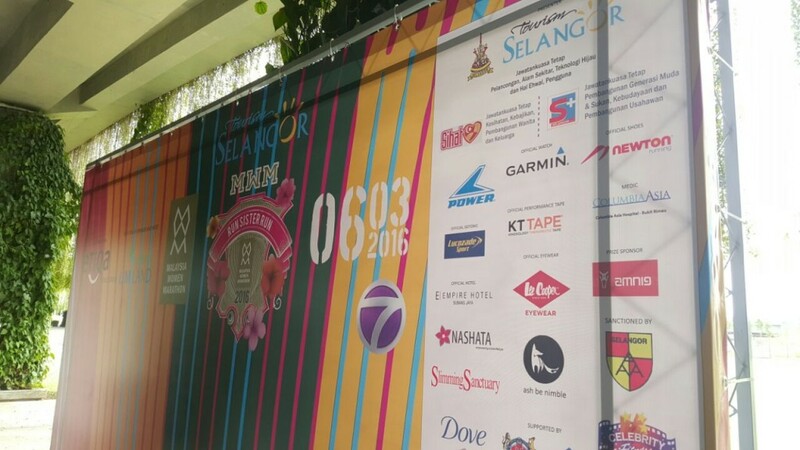 The run in Penang will be held on 2 April 2016. The flag-off will be at 8pm and the starting point will be at Queensbay Mall in George Town, Penang. So, what are you waiting for? Register here now! The theme for this year is Embrace Womanhood. In Jakarta, Australia and USA the run kicked off awesomely. Something a little bit more serious after that. There was a women empowerment dialogue session talking about leadership, brought to you by Gorgeous Geeks. With all the excitement and activities, we feel WOW RUN should continue as how Mudzalifah aspires it to be. 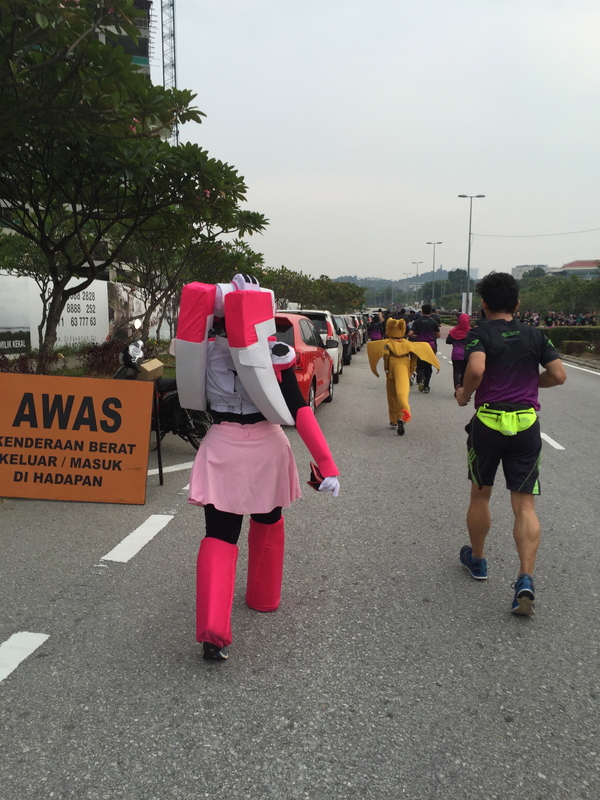 During the fitness challenges in Malaysia, an ultra marathoner made a significant observation. The ladies could really enjoy themselves and push themselves to do perform fitness activities. True, some ladies are shy and have certain requirements to perform fitness activities. We should continue to understand their requirements and provide suitable environment for them. Congrats to all organisers and sisters for making the spirit of fitness among us BORDERLESS. All racekit have been shipped out. Should you not receive it, just come and get one from Nashata booth anytime from 7am – 9:30 am on event day. Your BIB number is on your WOW RUN running shirt. 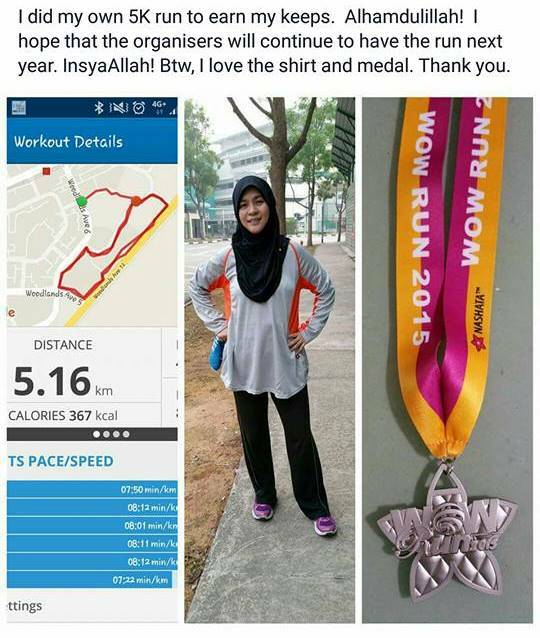 Please wear your running shirt to collect medal after Zumba. You can collect from 8:15am – 10:00am. No running tee, no medal. Activities are open to female ages 12 and above. Men can come and support only. We run & exercise for a better health,and your wellness is important to us. The air quality is expected to be unhealthy on the 25th October. For more info on haze forecast. please refer to the details here. Due to that, the run is cancelled. However, zumba will be moved indoor & the women empowerment dialogue will continue as scheduled. Despite the haze, the-ever-supportive gents will come to support you. 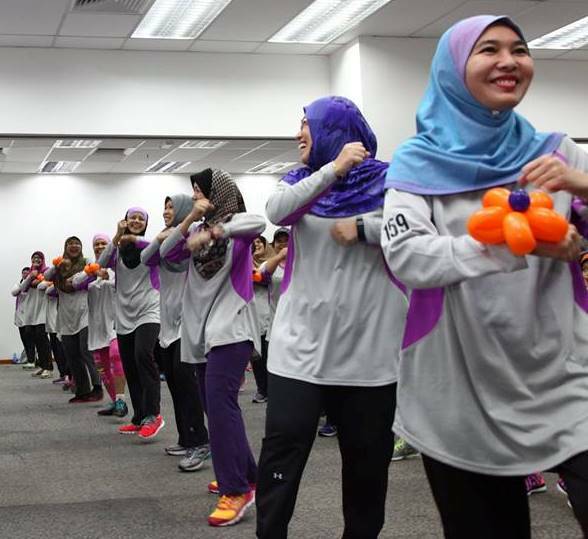 The firefighters who have agreed to cheer at the run and Azran Osman Rani, the ironman and CEO of iflix will be at the event to support Women of Wellness. There are a few changes since we are moving activities indoor. Fitness challenges are ON after ZUMBA ! So keep training so that you can win these prizes. 3. Highest # of Push UpsThe winner for each challenge will get a month FREE membership at the CURVES worth RM547. 3. 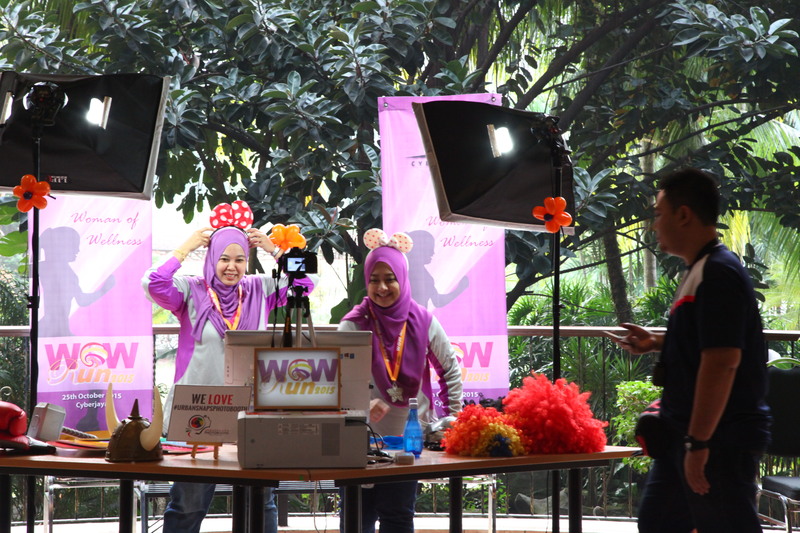 Best Wefie/Group PictureMake sure you use hashtag #WOWRUNMY when you share photos on instagram. Since the run is cancelled, we are starting the competition a day earlier 24th October until 25th October 8:15am. This session is limited to 50 pax only. Secure your seats HERE NOW! If you have any questions, please email wowrunmy@nashata.com. WOW Run is around the corner and we hope you are all set to have loads of fun! For a smooth and exciting experience, kindly go through the info provided below. Your racekit will be shipped to you 19 October onwards via POSLAJU. It takes 1 or 2 working days to reach you. Please update your shipping address to ensure someone can receive your pack. The running BIB will be on your shirt. Please run in the running shirt on that day to ensure you get to collect your medal at finishing line. 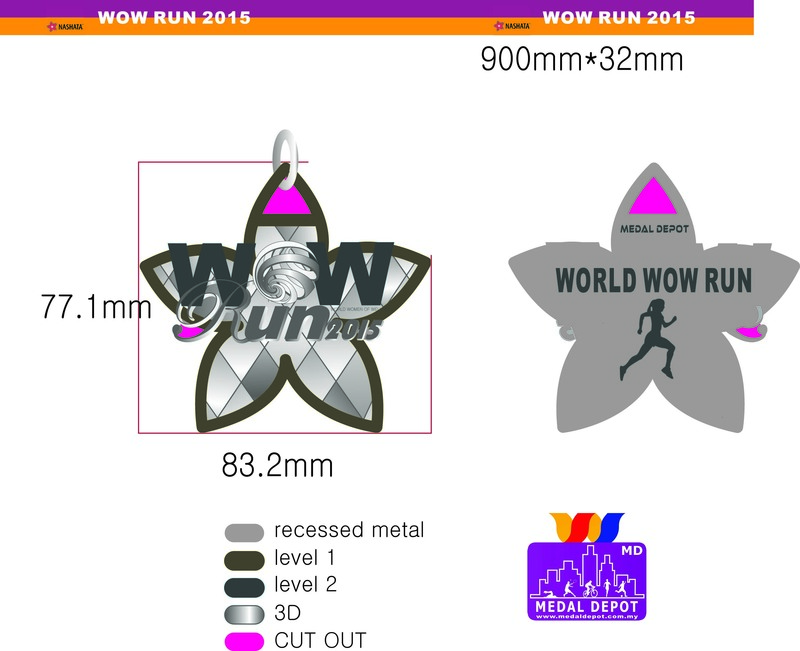 Only finishers running in the WOW RUN tee will get the medal. ALL REGISTERED participants will get a SPECIAL hand balloon. Here’s the directions on Waze. 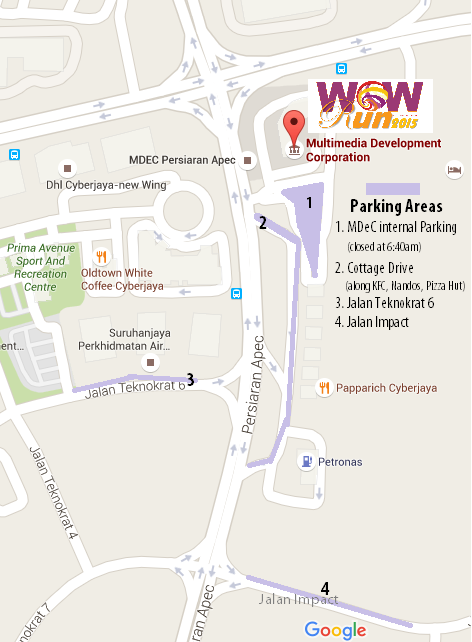 It is located along Persiaran Semarak Api, Cyberjaya. 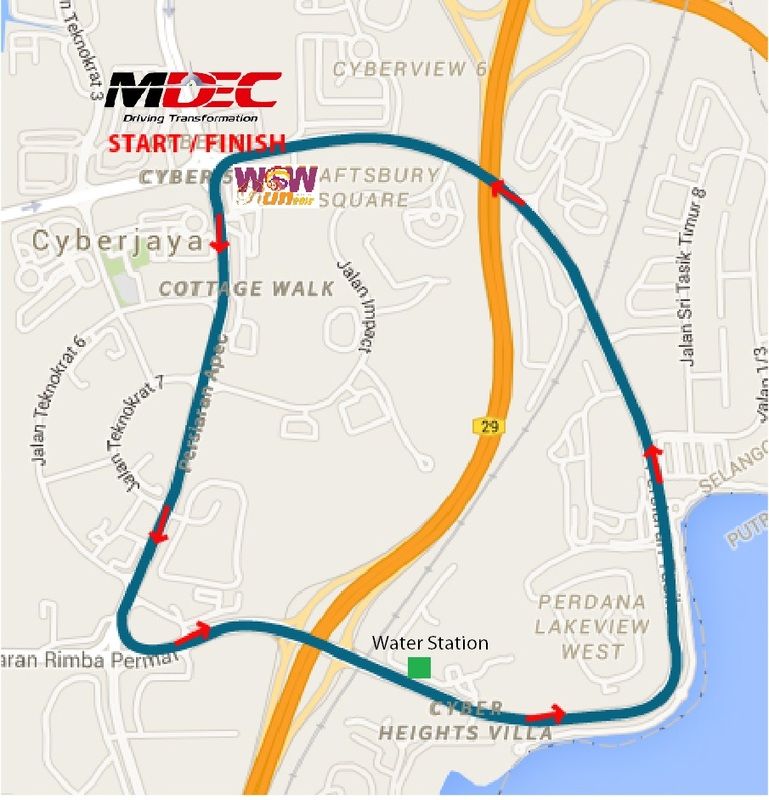 It is located along Persiaran Apec, Cyberjaya. 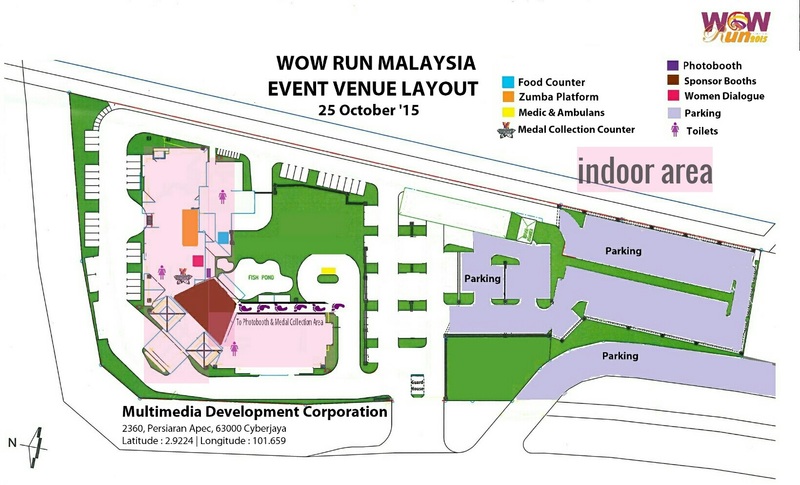 Multimedia Development Corporation (MDeC) Internal Parking Area. Our venue sponsor, the Multimedia Development Corporation will allow parking within their compound if you arrive before 6:40 am. After which, you need to park at other designated areas. If you park at this area, due to safety, we will only allow you to leave after 8:15 am; when all runners have reached finish line. Take immediate left after you pass MDeC building to get into the Cottage Drive. You will see KFC, Nandos Chicken, Pizza Hut and PappaRich along this road. Open from 7:30am – 9:30am. You can enjoy your food at the eating area. It is a nice lawn by the fish pond. Any girls can join the zumba. No registration is required. Medal Collection is at the counter next to Bunga Raya Auditorium. You need to enter MDeC building to go to the Auditorium. Only registered runners who finish the run are entitled for medal. There is a photobooth close to the sponsors area. Get all the fun & exciting shots here! You can only park in this area if you arrive before 6:40am. There are 3 toilet areas in MDeC building. 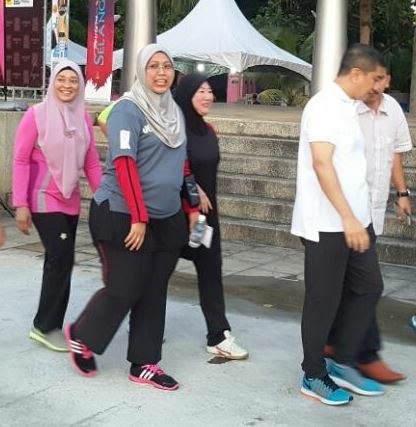 The run/walk starts and finishes at MDeC. The water station is at the bus stop, right after SM Seri Puteri. There will be many marshalls on bike and foot to support you. If you need any assistance, just let them know. Enjoy the run and do take a lot of pictures. Use #WOWRUNMY when you share pictures so that we can find you. More info on Prizes Section below. The winner for each challenge will get a month FREE membership at the CURVES worth RM547. 3. 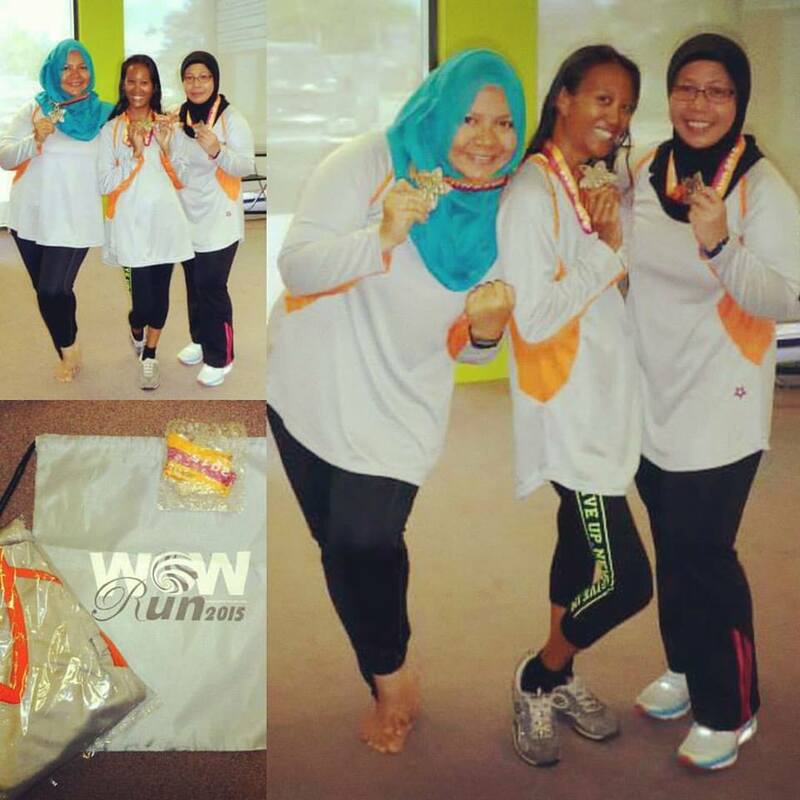 Run strong photoMake sure you use hashtag #WOWRUNMY when you share photos on instagram. Competition starts 6:45am till 8:15am. We run & exercise for a better health, and your wellness is important to us. We are expecting a good weather on that day, but should the air quality index is unhealthy; i.e, API reading for Putrajaya on http://apims.doe.gov.my/v2/ is above 100 on running day (as of 1 am 25th October), the run will be cancelled. However, zumba will be moved indoor & the women empowerment dialogue session will continue as scheduled. 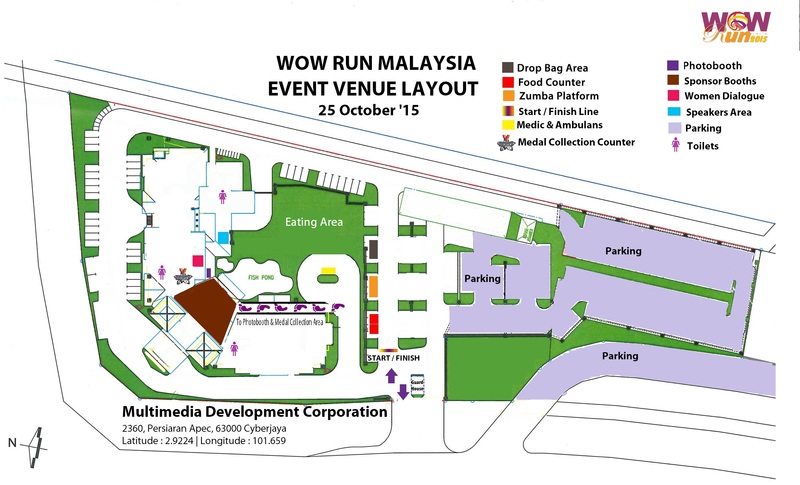 You can pick up the goodie bags and medal at MDeC on event day from 7:30am – 9:30am. The run will continue should the API reading is below 100, and we encourage all runners to bring and wear mask if the API is between 50 and 100. Should it rain, WOW RUN shall continue. 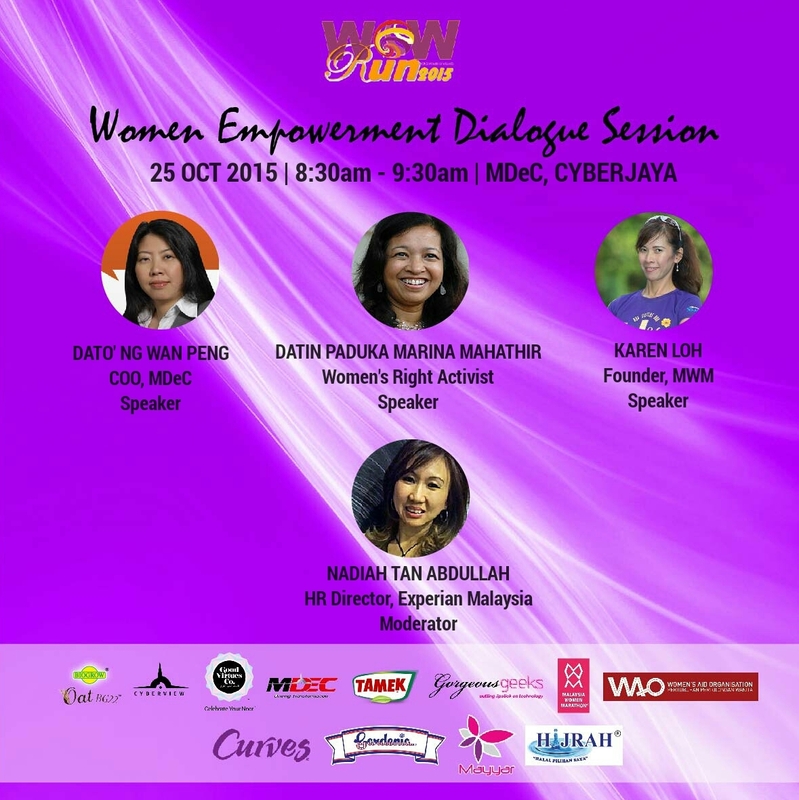 Kuala Lumpur, 4 August, 2015 – On the 25th October 2015, women from all walks of life will come together and run, zumba and have conversations on leadership in Cyberjaya. 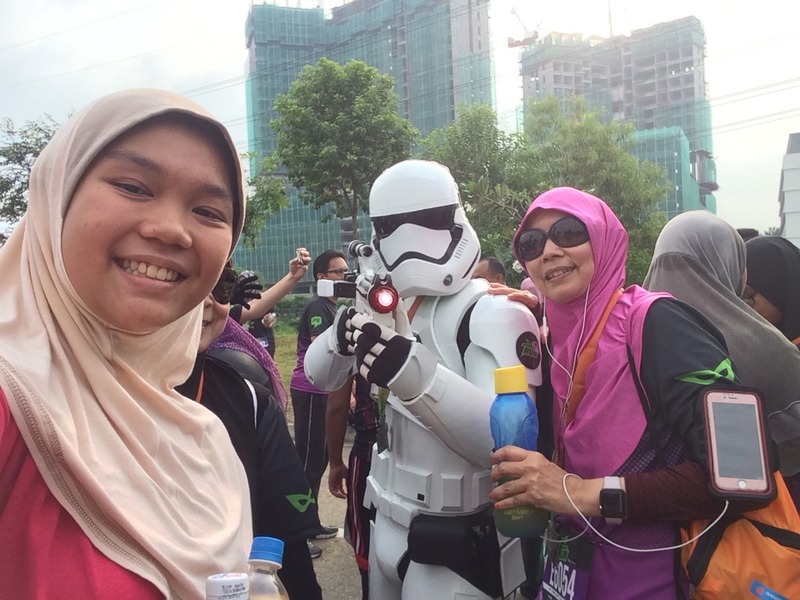 Organised and co-sponsored by Nashata, the run is supported by Gorgeous Geeks, Malaysia Women Marathon and Women’s Aid Organisation. On the 25th October, 7am, runners from six countries will run 5km together. 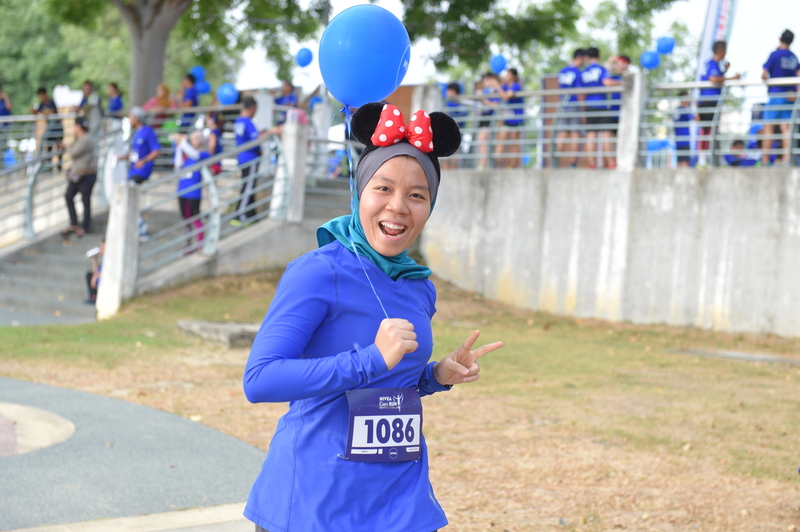 Originated from Singapore by Muzdalifah Anuar in 2014 with 1,000 woman runners, the WOW RUN, this year expands to five countries that includes Malaysia, Indonesia, Philippine, Australia and the United States of America. 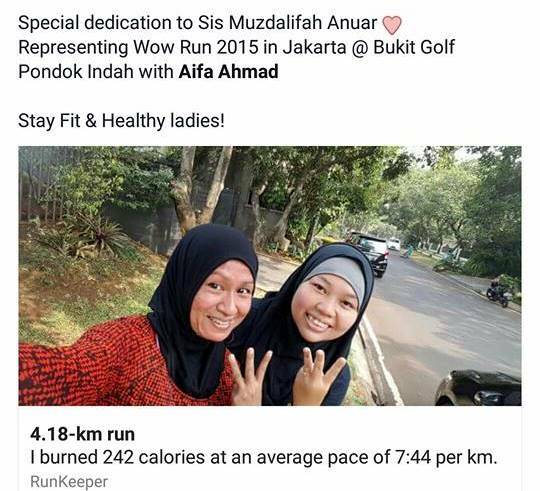 When she started the run in 2014, her goal was to promote fitness in Islam. 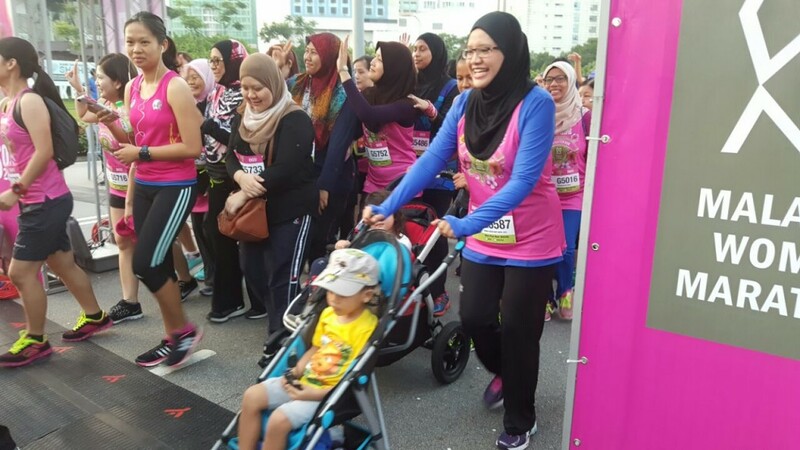 This year the run is theme #embracewomenhood, Muzdalifah is spreading the love of active lifestyle with other sisters across the globe with the spirit of sisterhood. 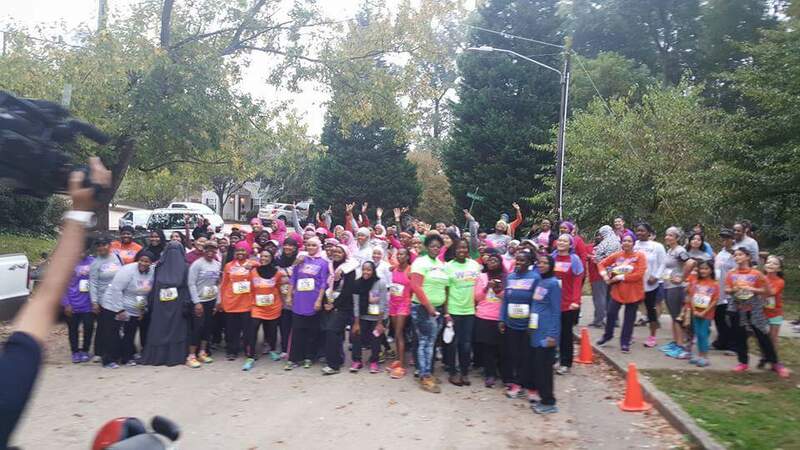 The run aims to garner and motivate women to lead an active lifestyle together united as sisters in the spirit and vigor of sisterhood, and not as separate nations. 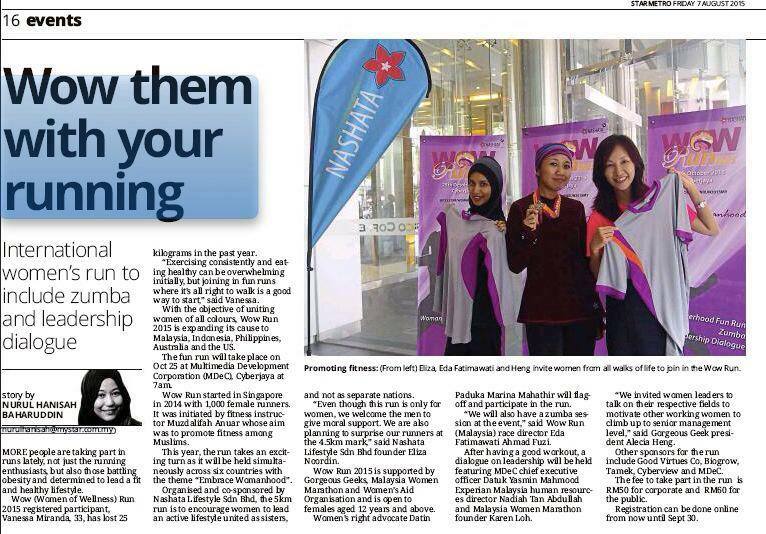 In Malaysia, the run will be officiated by Datin Paduka Marina Mahathir. Marina is notable for voicing women’s rights in Malaysia. According to a study by UK Medical Journal, half of women in Malaysia are overweight or obese, and another study on Obesity Journal states that in Malaysia obesity levels were highest among adults 40–59 years old. 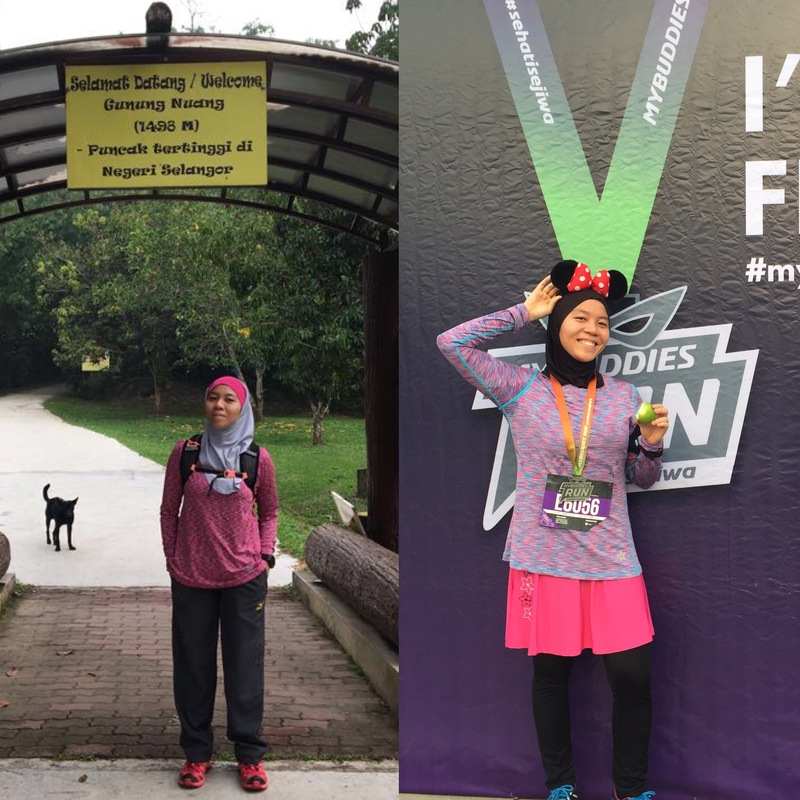 Eda Fuzi, the race director in Malaysia, was once obese and now she runs marathon and ultra-marathons to keep fit. She urges women to pick up running to keep fit as it is the most convenient and easiest sporting activity. 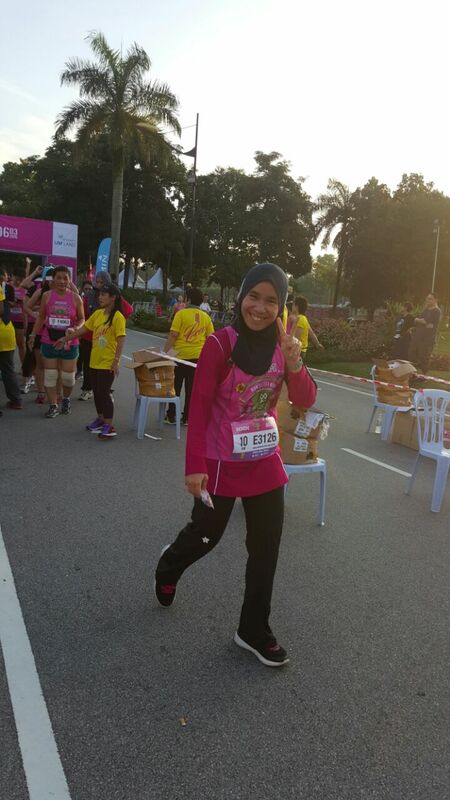 “You can run anywhere, anytime as long as you have your running attire and shoes,” says Eda. 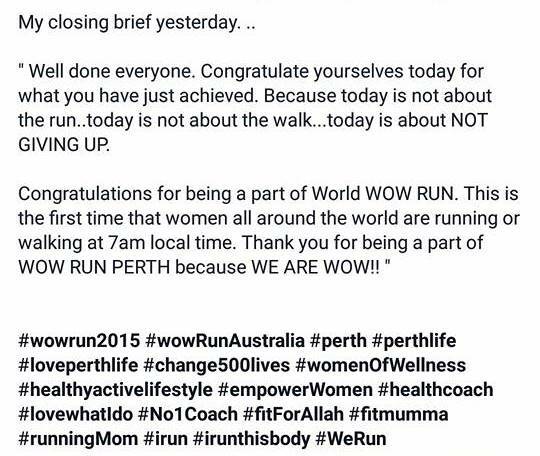 “Running is for everyone, and because of that, we are bringing together women groups to bring the WOW RUN message across,” she added. 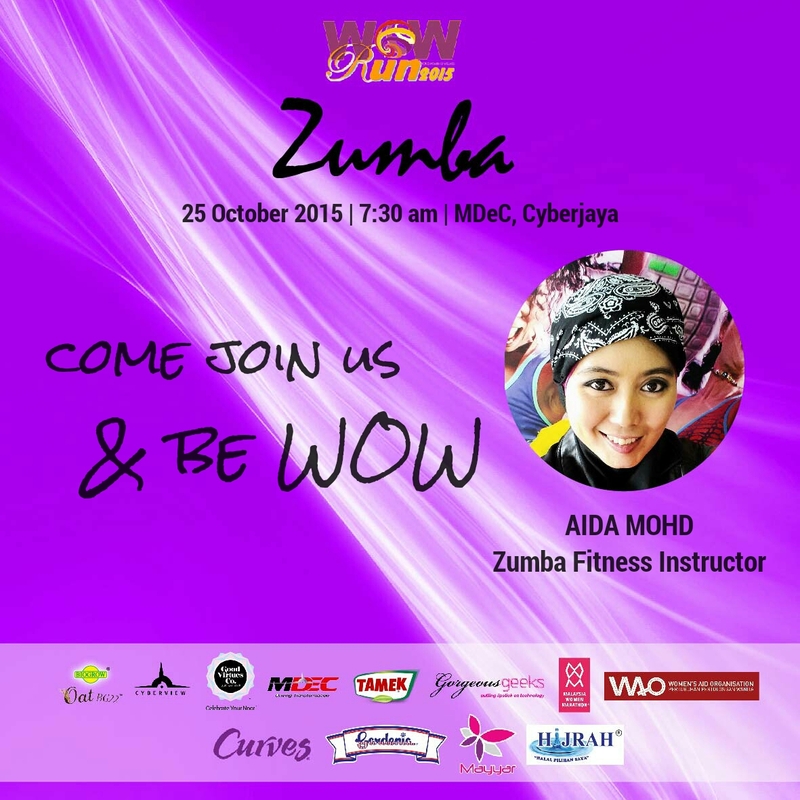 To add more energy into WOW RUN, Aida Mohd, a Zumba instructor will lead the runners through a 30 minutes workout. Also a part-time newscaster, Aida says Zumba is incredibly fun and it is a work out for the body, mind and soul. 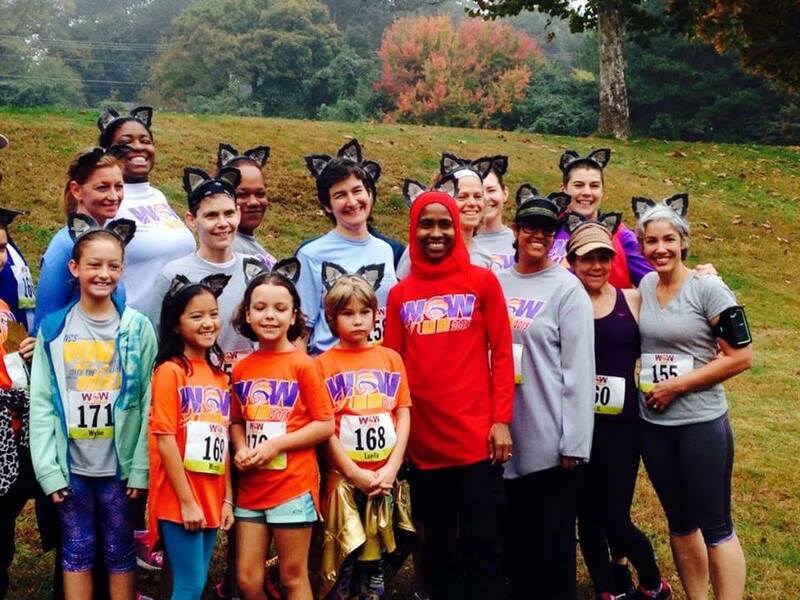 Girls can have fun and expand horizon at the WOW RUN. While cooling down after a good workout, listen to aspiring women discussing leadership. Alecia Heng, the President of Gorgeous Geek is putting together a panelist of women leaders to talk about leadership in their respective fields. Among the panelist and host are Dato’ Yasmin Mahmood, Nadiah Tan Abdullah and Karen Loh. Alecia says although it was reported on the Malaysia Economic Monitor November 2012 that over 50 percent of all women received a university degree or higher, only 30% women are at senior management level. Women can make it to the top and these fit ladies will share with you how. 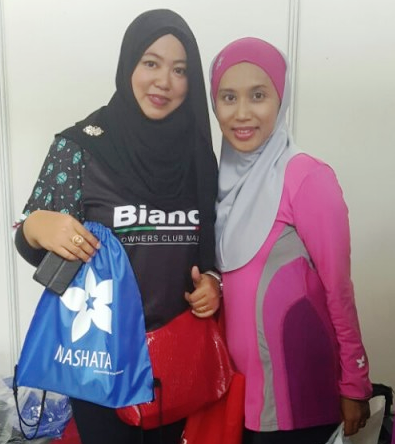 Nashata was one of the inaugural sponsor for WOW RUN 2014 in Singapore and this year runners will get again the modest running attire designed by Nashata. All these exciting activities are at the happening at Multimedia Development Corporation (MDeC), in Cyberjaya. 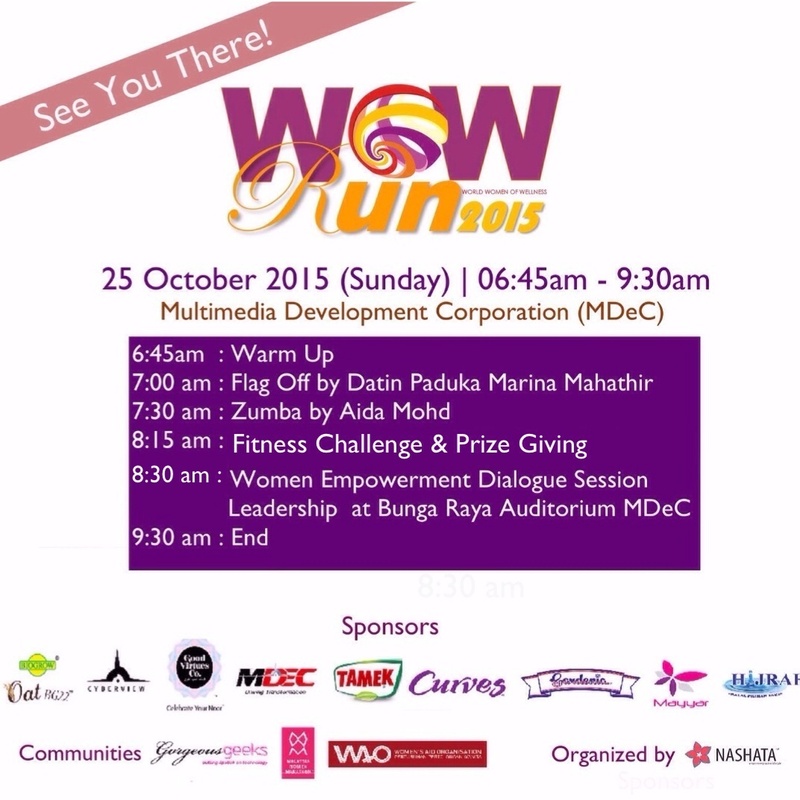 Other sponsors for the run include Good Virtues Co, Biogrow, Tamek, Curves, Cyberview as well as MDeC. 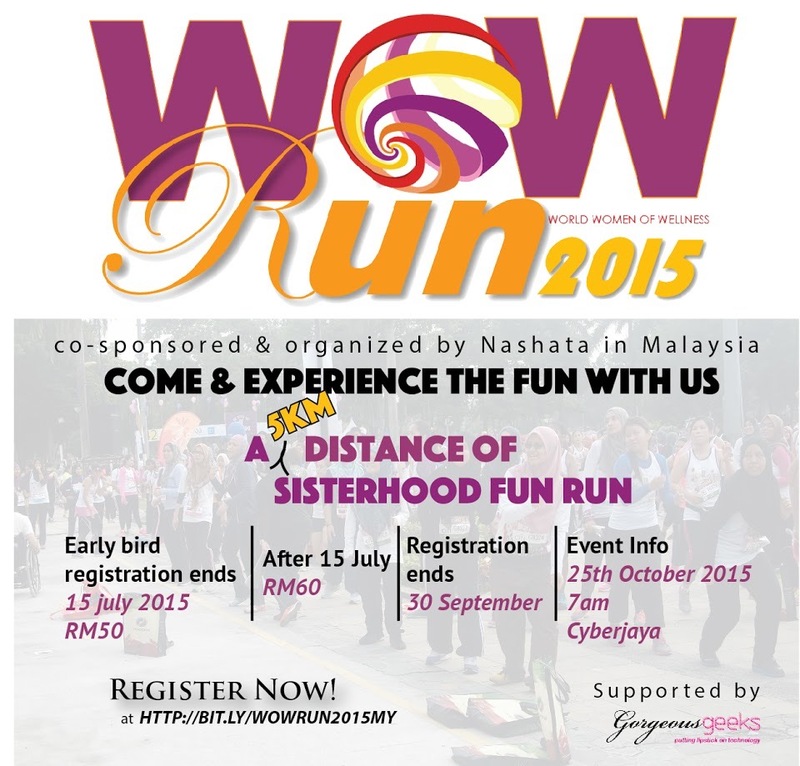 For more information and to register visit bitly.com/WOWRUN2015MY. There is a corporate rate of RM50. The run is for women age 12 and above but the men are welcomed to come and cheer. Registration closes on the 30th September 2015. The WOW Run is 4 months away and it is getting more and more exciting as we are working hard to put together All Girls Fun Stuff for you. You can refer to our earlier post about the run if you missed it. So, here are a few updates! 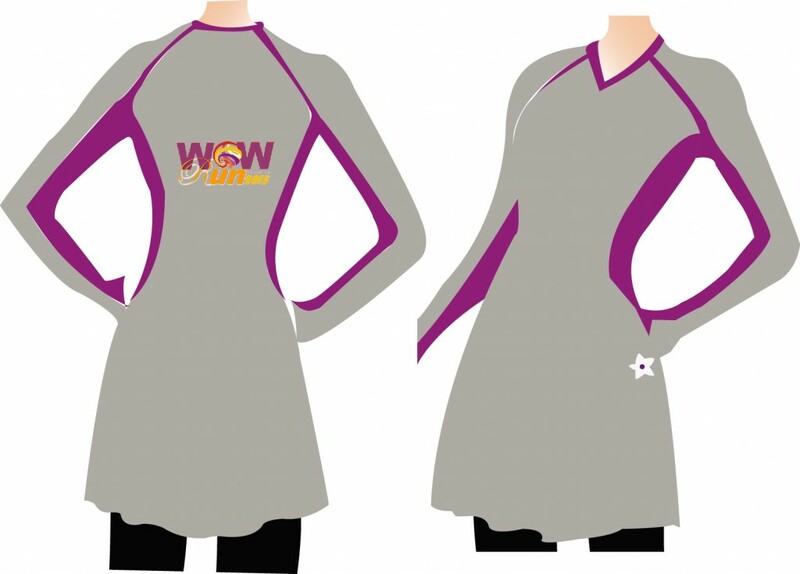 Our in-house designer came out with this intricate design for the WOW RUN and here’s the final design. 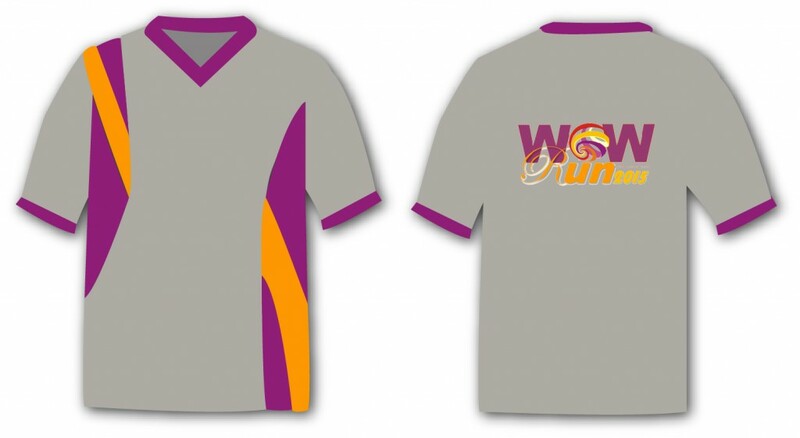 It would look perfect on your grey running tee don’t you think? 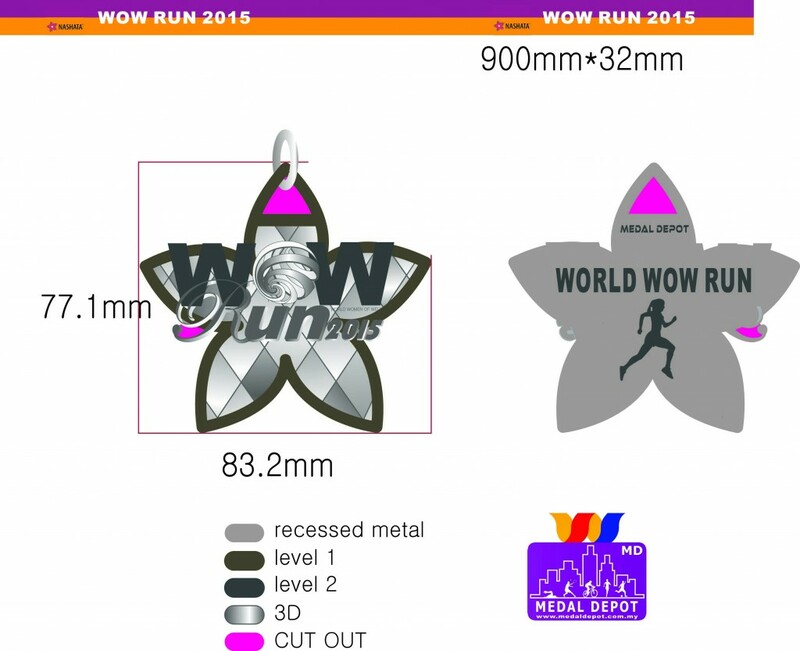 The WOW Run Malaysia is supported by Gorgeous Geeks and the Malaysia Women Marathon. Together, we are putting together Women Empowerment topics for all our sisters. More info coming soon. They are giving away special. gifts for ALL our runners, winners and online shoppers! Opps, if you have not heard about Good Virtues Co, they produce beauty care products from head to toe. Those who have registered will get an e-voucher to get a FREE shower cream when you purchase online. 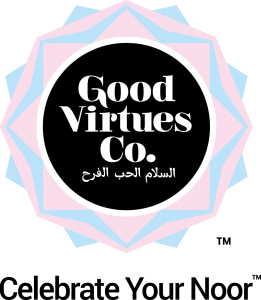 What is unique about Good Virtues Co. is their products are HALAL & free from Mineral Oil, SLES, ALES, Parabens, synthetic colourants, and are not tested on animals. They use 100% non-animal derived ingredients in our products. 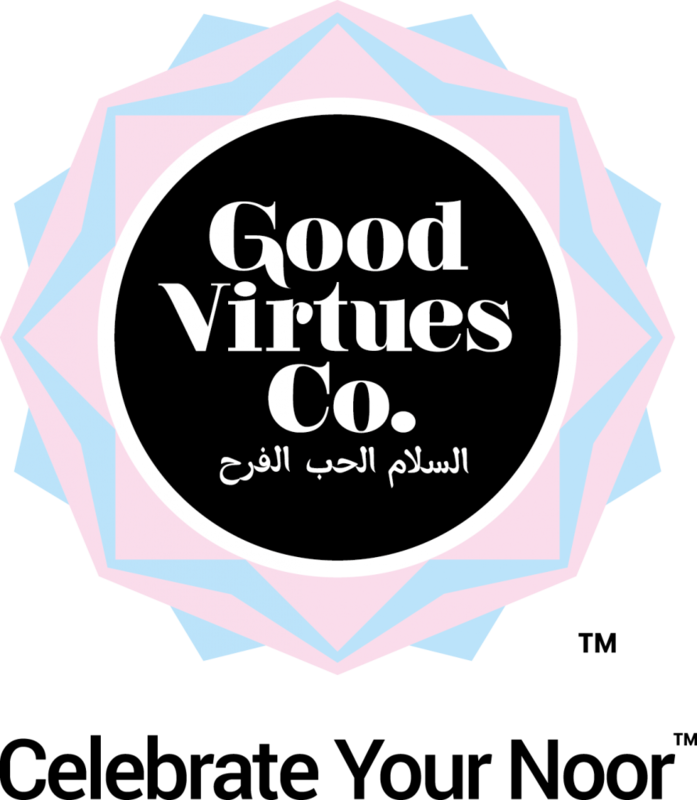 Read our special feature on Good Virtues Co. and their products. The custodian of Cyberjaya is one of our initial key sponsors. Cyberview spearheads the development of Cyberjaya as a Global Tech Hub. They too started off Cyberjaya Network Women Network with an aim to Empower Women In Entrepreneurship last September. We have more to update but we will include them our next post. We will share who our guest of honor is, the route and more sponsor updates. So stay tuned & share the run with your friends and get them to join the excitement too!